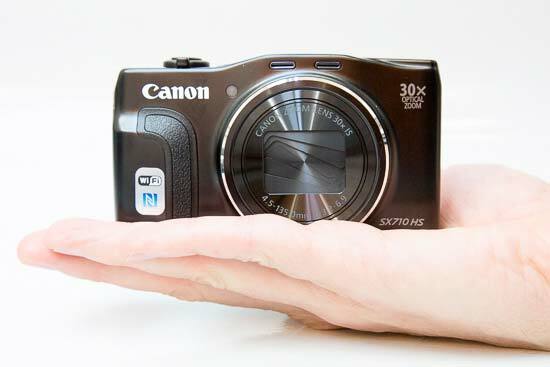 The PowerShot SX710 HS is the new flagship model in Canon's travel-zoom camera range for 2015. Despite compact 112.7 x 65.8 x 34.8 mm dimensions, Canon has managed to cram in a 30x zoom lens with a 35mm-equivalent focal length range of 25-750mm. Thankfully lens-shift Image Stabilisation is included too, now with 5-axis Advanced Dynamic IS, which combined with the sensor's maximum ISO 3200 sensitivity should ensure sharp shots at extreme focal lengths and in low light. 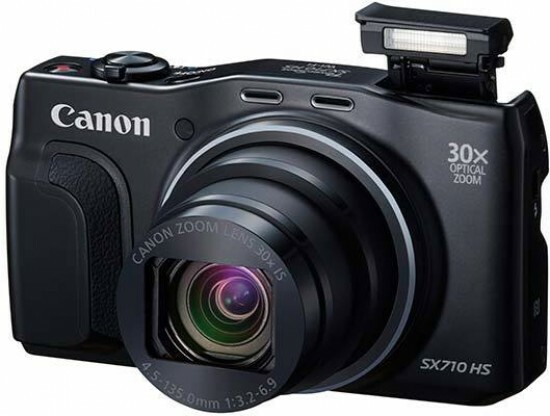 The Canon PowerShot SX710 HS' sensor itself is a 1/2.3” back-illuminated, high sensitivity CMOS device with 20.3-million effective pixels and is paired with Canon's latest DIGIC 6 image processor. The SX710 HS also offers an Auto Zoom function which automatically detects the number of people in the frame and adjusts the zoom level, Full HD 60p movies with stereo sound, a 5-axis image stabiliser, Manual, Av and Tv shooting modes, the Creative Shot mode which captures a standard image plus five stylised variations, and the Hybrid Auto mode that automatically captures a 4-second movie before each shot and combines the stills and video into a montage. You also get Wi-Fi connectivity and NFC for wireless image sharing and remote camera control, all for around £329 / €399 / $349. The Canon PowerShot SX710 HS is virtually identical to last year's SX700 HS model, so a lot of the comments that we made in that review apply equally to the 2015 model. 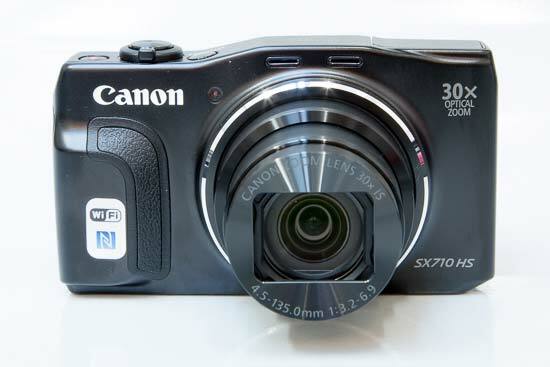 Whilst it may be crammed with the latest technology, first impressions of the Canon PowerShot SX710 HS aren't overly inspiring, although it does at least have a metal casing and consequently feels solid and well made. A pronounced rubberised ridge on the front and the raised shooting mode dial at the rear make the camera surprisingly easy to hold for what is otherwise a relatively slim camera that'll slip easily into a pocket or small handbag. 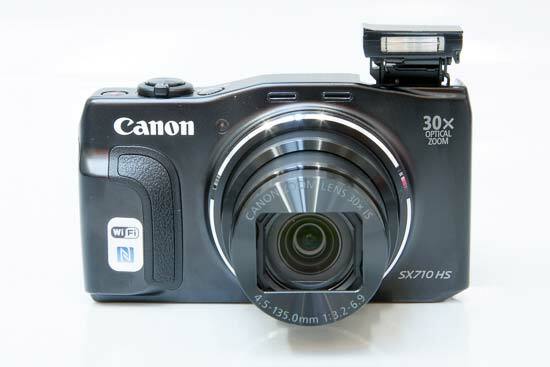 Atop the Canon PowerShot SX710 HS is a familiar zoom ring encircling the shutter release. Fortunately the zoom ring has two speed settings, so you can move it a little to make fine focal length adjustments, or give it the full twist for a quicker zoom. The SX710 HS also has a clever zoom assist feature which zooms the lens out to aid framing when using the longer telephoto settings, then automatically zooms back in again, accessed by holding down the dedicated button on the left flank of the camera. Canon have extended this feature for 2015 by adding three options for people (Face, Upper Body, Whole Body), so that the camera can automatically keep your subjects within the frame. 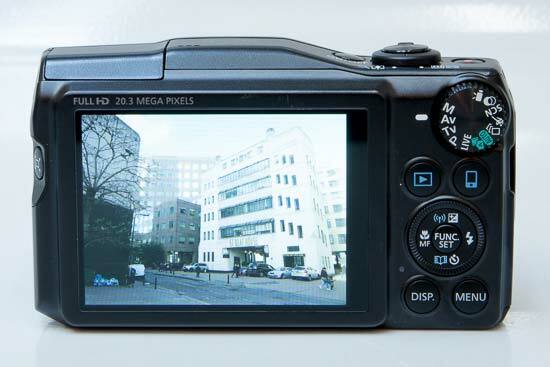 The SX710 HS also offers an upgraded image stabilisation system. White it still compensates for 2.5 stops, the 5-axis Advanced Dynamic IS compensates for fast movement when recording video, such as running alongside your subject or walking backwards. Alongside the shutter release is a one-touch movie record button, with the SX710 HS offering Full 1080p recording at 60fps or 30fps, as well as 720p at 30fps. At the opposite end sits the popup flash. You'll need to manually eject the flash using a switch on the left side of the camera, but this does eliminate any chance of the flash going off automatically when you're not expecting it. Power up the SX710 HS and it springs into life in a fraction over a second and you're greeted by a simple – if slightly dated – on screen display, but all the information you need is still easily readable. The menu interface is also simple and quick to navigate, with the Func/Set button displaying the most common shooting options together. When you're ready to snap a shot, the Canon PowerShot SX710 HS doesn't waste any time in autofocusing and is quicker to find its mark in low light than you'd expect. The system can get confused when shooting a macro subject which doesn't occupy much of the frame, but otherwise you can leave the camera in Auto mode safe in the knowledge it'll focus fast and accurately. On the subject of macro focusing, a 1cm-minimum focus distance is very good for this class of camera. The SX710 HS is also a bit of a speed demon when it comes to continuous shooting. Sure, its 4.5fps capture rate with continuous auto-focusing isn't exactly blistering, but unlike many a compact it won't throw in the towel after a handful of shots and slow to a snail's pace. Depending on the speed of your memory card the burst rate will eventually deteriorate, but we found the camera kept on shooting at least 3fps. You can also indulge in a more rapid 6fps shooting speed for an unlimited amount of shots, but focus and exposure are locked at the first frame. Of course if all this still isn't fast enough to record the action, there's always Full HD video capture. When you'd like to get creative the Canon PowerShot SX710 HS delivers a modest but useful range of effects. There's those Creative Shot and Hybrid Auto modes mentioned earlier, but if you delve into the shooting mode menu you'll also find effects like fish-eye and miniaturisation distortions, plus a ubiquitous toy camera retro look. These are mixed in with regular shooting modes which also includes a useful Smart Shutter function which will automatically snap your shot when the camera detects a smiling face. Switch to the My Colours menu and you can set all shots to be automatically recorded with enhanced colour saturation, sepia tones or in monochrome. It's perhaps a little disappointing that you don't get a touch-sensitive screen, but the standard 3.0-inch display does the job well. It's bright with decent contrast and great viewing angles, and the 922k-dot resolution is more than respectable. Alongside the screen is a round shooting mode dial that selects between 12 different modes. Commendably the SX710 HS offers the full range of PASM creative shooting modes, ideal for those looking to take more control, with the rather thin rear control wheel used to set the aperture and shutter speed. Switch to Creative Shot mode and the camera shoots six images in a burst. The first is an unmodified photo, but the remaining five are customised by the camera with different aspect ratios and colour effects so you can pick the funkiest version afterwards. Choose the Hybrid Auto setting and the SX710 HS operates as normal, but rather than just snapping images, it discretely captures an accompanying 4-second video too. The resulting footage and stills are then merged to form a video and photographic montage of your day. It's a neat trick that's somewhat similar to the Zoe feature on some HTC smartphones and will either be a love-it or forget-it feature. Moving down the Canon PowerShot SX710 HS' rear panel we find decent-sized buttons to control playback and a a dedicated button to engage the camera's Wi-Fi mode. 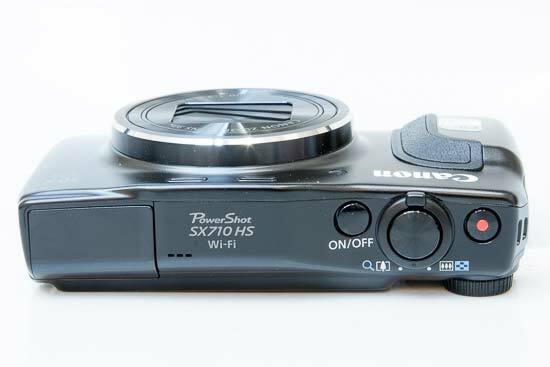 Simply install Canon's CameraWindow app on your mobile device and connect to the SX710 HS' wireless hotspot and you can wirelessly transfer photos from the camera or control it remotely if you fancy some stealth shooting. You can also tag the location of every shot using the GPS via Mobile functionality. The system is slightly laggy, but we found the connection to be stable and image transfers relatively rapid. Less funky but no less important is the SX710 HS' battery life. It's 230-shot lifespan is merely average, so if you're set to be away from the charger for some time, activating Eco mode can eek this out to a more impressive 315 shots-per-charge. This modest thirst for power is primarily achieved by dimming the display after just a couple of second's inactivity, and turning it off altogether shortly afterwards. Pressing any button will restore life instantly though. The effect is rather like a start/stop system on a modern car and doesn't seem to have any downsides, providing you don't have to wait more than a few seconds to take your shot.